This exciting project began when a couple contacted us while house shopping. They found a 1980s contemporary colonial in Delafield with a great wooded lot on Nagawicka Lake. The kitchen was outdated, but it had plenty of space and potential. We toured the home, learned about their design style and dream for the new space. 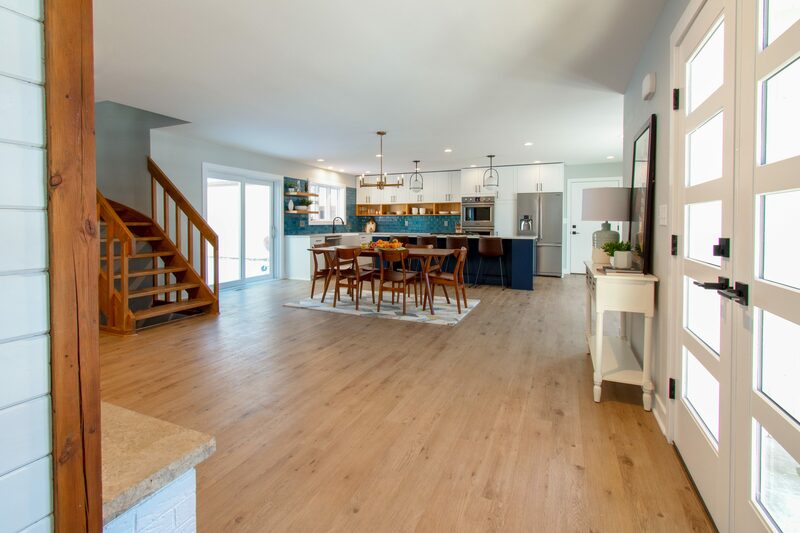 After presenting a design they loved, the couple purchased the home and worked with the Kowalske team to finalize the details. The goal of this project was to create a contemporary space that was interesting and unique. The original entry was dark and closed off. By removing the dining room walls, we opened up the space for a grand entry into the kitchen and dining room. The open-concept kitchen features a large navy island, blue subway tile backsplash, bamboo wood shelves and fun lighting. The Kowalske team loved helping this couple turn their outdated kitchen into their ‘dream house’.